(Vicolo is now closed) I’ve got to hand it the owners of Vicolo for they are certainly persistent. Freshly opened back in December as an Italian eatery, the space is still haunted by the ghost of the very short lived, Frunchroom (the décor hasn’t changed much since it closed late last year). 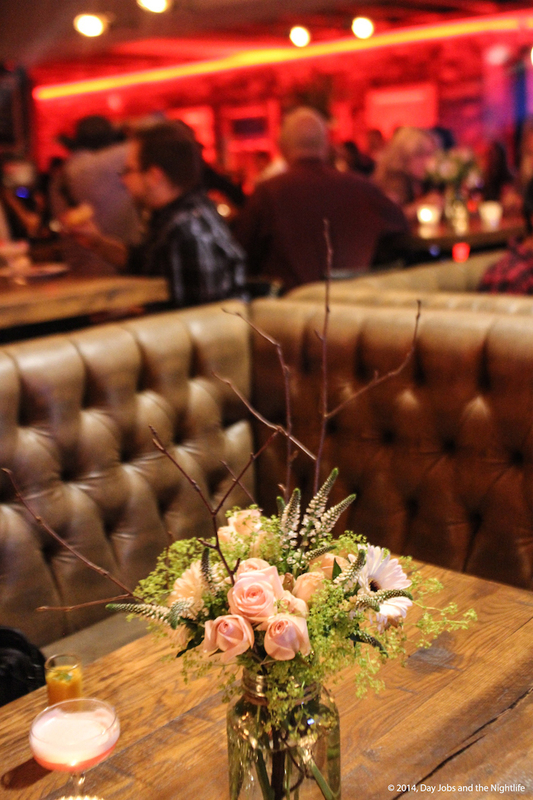 Though the ghost of restaurant past may still be lurking, the space now feels like what it should have been all along. Vicolo doesn’t just fit the scenery better. The restaurant is now more focused and the menu, though more familiar to us, still offers a collection of Italian classics with a nice North American flair. Here’s our take on how the restaurant is doing only a couple of months after opening. After one of the biggest opening parties I’ve ever seen thrown in Montreal, Vicolo is now settling into its “business as usual” groove on Rene-Levesque. Last week, we were invited back to the restaurant to take a seat in one of their comfy booths to taste a few items from their menu. With snow falling from every direction possible across the city it was no surprise that Vicolo was quiet when we arrived. It was early in the evening on a game night so the quiet wasn’t going to last very long, especially for a restaurant that’s a stone throw from the Bell Centre. We settled into our booth and prepared for the onslaught of Italian food that would soon fill our table. Our waitress had been waiting until we looked ready to come over with the menus. After taking our drink orders she slipped away momentarily until they were ready. The cocktail menu is designed by none other than Lawrence Picard and features a smashing selection of his signature-styled drinks. My dining partner chose the Basilico (a tasty concoction of Martini Rosso, Campari, basilica and ginger ale) while I went with a classic Old Fashioned. The only major strike against Vicolo for me was the cocktail portion of the evening. My Old Fashioned was missing ingredients and basically tasted like watered-down bourbon on ice. When I asked the waitress for a maraschino cherry she pleasantly brought the cocktail back to the bar and against the bartender’s will he dropped two red orbs in the glass. Though the Basilico tasted great thanks to Picard’s mixology, the bartender garnished the glass with a piece of limp brown basil. I don’t know how Vicolo lets that pass. It’s negligent and I don’t know another bartender in this city who isn’t able to mix an Old Fashioned or who doesn’t take pride in presenting his work. This was a blemish on my experience. With the mediocre cocktail experience out of the way, we moved on to more solid sustenance. 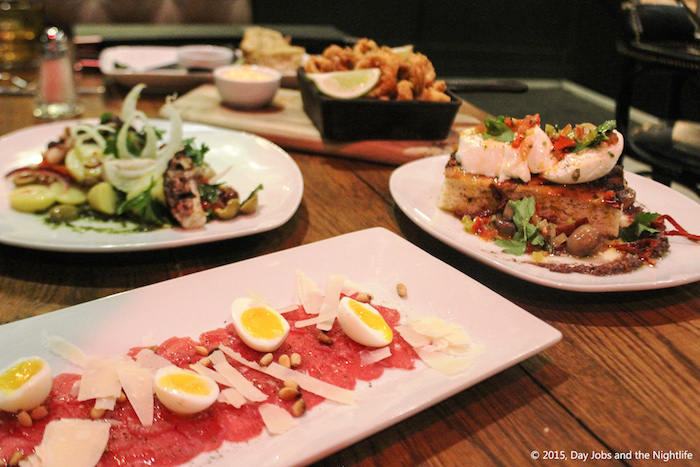 We ordered several items from the appetizer menu including the calamari, the burrata and grilled squid. As a surprise, the kitchen also sent out a plate of beef carpaccio. The breaded calamari was delicious, crunchy and bust with peppery flavour. The spicy mayo that came with it added a delightful zing. The grilled squid came ornately presented with a parsley pesto, fingerling potatoes and olives. The squid was tender, well cooked and blended well with the pesto and olives. I really enjoyed the burrata as well. Like the squid, the plate comes decorated with different flavors. 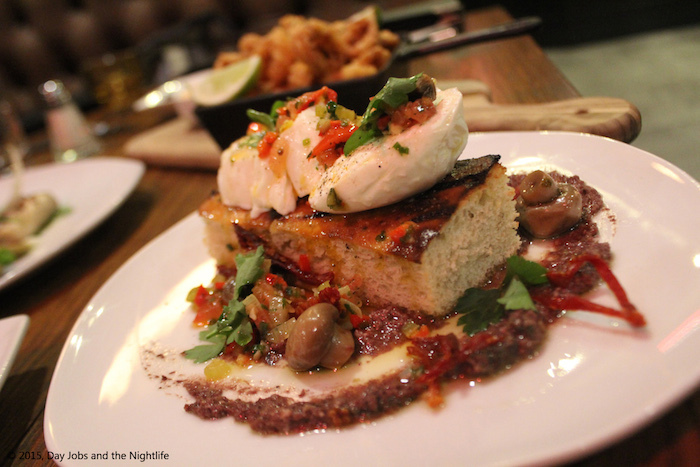 The buttery burrata comes served on a bed of homemade focaccia with a house olive tapenade, marinated mushrooms and sundried tomato. The focaccia is delicious with a wonderful rosemary flavour. I found the bread to be a bit too thick but other than that, this dish was wonderful. The beef carpaccio was textbook but served with roasted pine nuts and truffle oil. I’ve been noticing an increasing trend in the use of truffle oil around the restaurant circuit and for the most part I find it overpowers the rest of the dish. The beef would have been just as delicious with a drizzling of olive oil. Overall Vicolo does a great job with their appetizers and a shared collection of these dishes could make for a wonderful meal on their own. 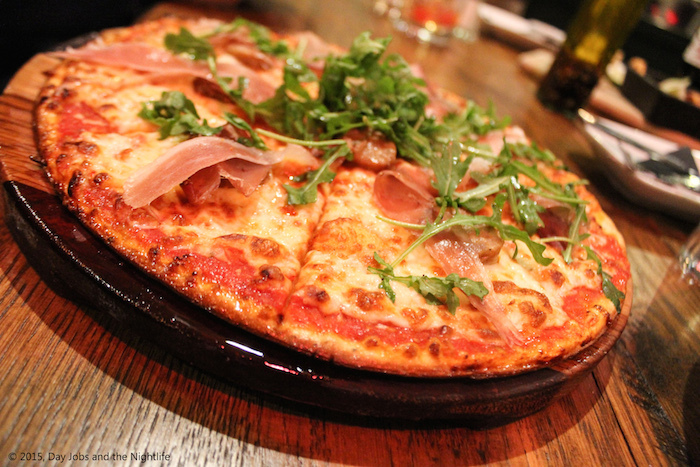 Moving onto the main course we focused our efforts onto two Italian staples, pizza and pasta. 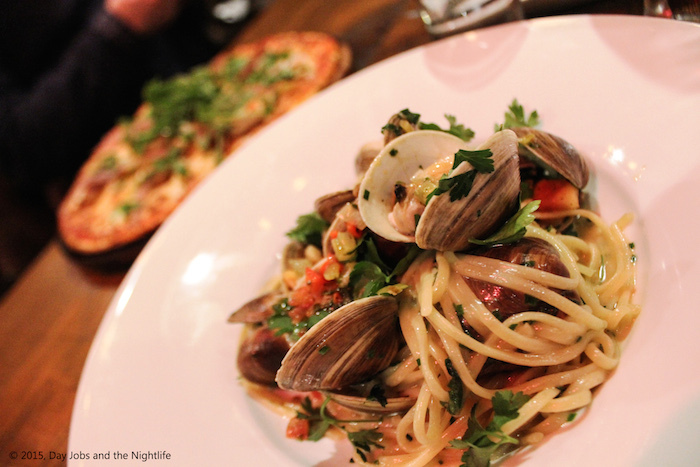 We went with the prosciutto affumicato pizza and the linguini alle vongole. The linguini was spectacularly presented and tasted as good as it looked. Almost overflowing with clams and made with white wine, butter, parsley and tomato, the dish remained simple and balanced. The pizza, though it may not be at the top of my list, was good on it’s own terms. The crust was crisp, the sauce was tangy and the ingredients worked well together. It was a “what you see is what you get” type of pizza, no surprises. 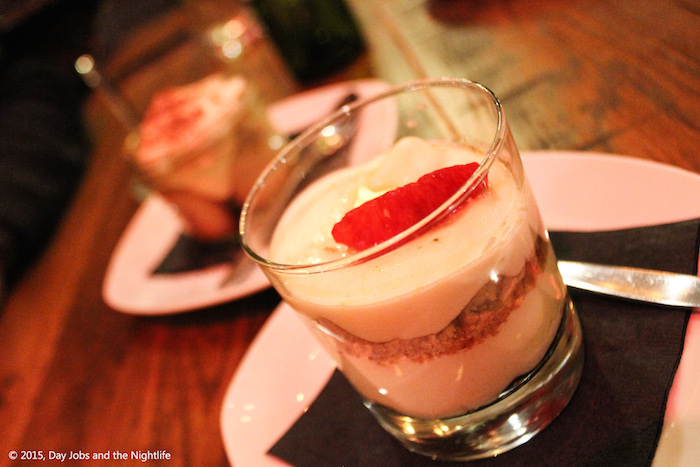 For dessert, we had the pleasure of trying two very different things, a delicious cheesecake and an out-of–this-world tiramisu. Both desserts were fresh and a perfect cap to our meal. 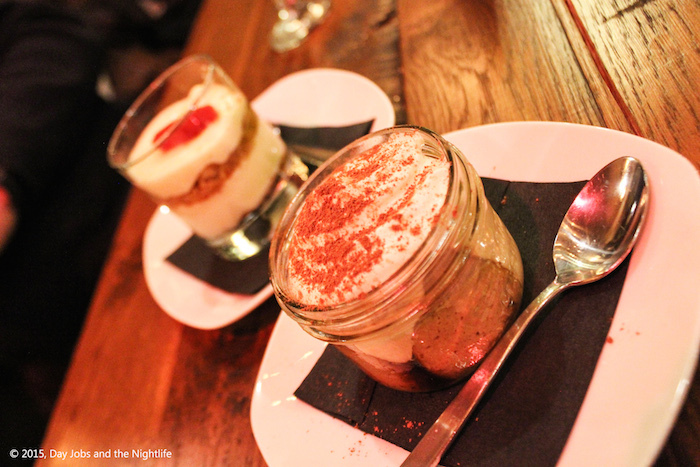 The tiramisu is homemade from a recipe passed down to the restaurants manager (he also made the dessert that day) and was a solid take on the classic. Notes of coffee, cream and a little coco made this one of the best I’ve ever tasted in the city. It’s definitely something to go back for. Vicolo is a restaurant that can easily defy expectations. It’s spacious, comfortable and primed to be front and centre as Montreal’s downtown expands toward the west with a dozen new towers in various phases of construction. 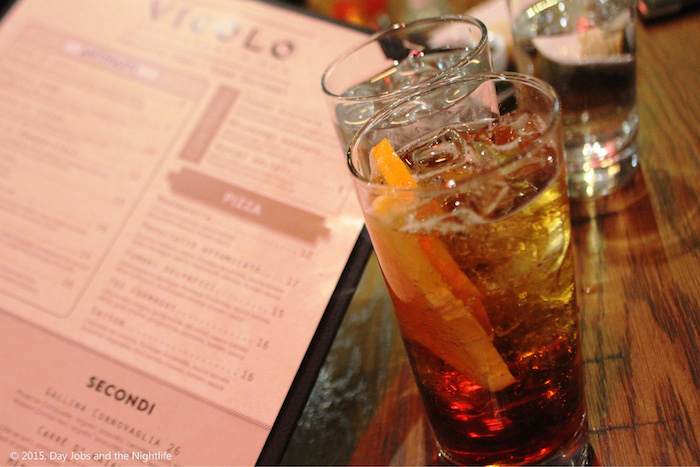 Thought it has a lot going for it, Vicolo does have its battles to face. This area of the city is a tough place for a restaurant to get its footing. Its size is also an issue as bigger restaurants have more seats to fill and can look empty even with 20-30 people seated. It won’t all be a battle though. The table service was wonderful and the warm décor is on-trend, rustic yet urban (though I don’t love that “brick” wall with the hanging doors, it’s distracting in another wise perfect setting) and the idea to open Vicolo, as an Italian eatery, was a smart move. You can’t go wrong with Italian food and the area needed a reliable restaurant for those looking to break the link with bigger restaurant chains. In the end though, it will be the food and the service that will forge the relationships Vicolo needs to become the heavy-hitter it’s striving to be.